Lindsay travels extensively studying what people want but cannot find in fashion as they search for their identities. 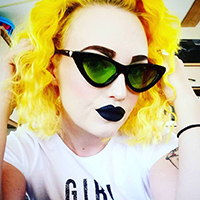 Lindsay is a huge fan of cartoons, wacky horror movies, sci-fi, tarot cards, dark arts, also retro pin-up and 60’s mod fashion and culture. Lindsay Lowe Eyewear has a variety of styles for people with tastes outside the mainstream of fashion and pop culture.